As skiing and snowboarding have grown in popularity ski resorts have become more crowded, which has led to freshly fallen powder becoming a rarer commodity. Many people now hike out of ski resort boundaries to access powder snow, but this is a tiring and time consuming process and often skiers and snowboarders just want instant powder snow without having to work hard for it. Heli-skiing is defined by using a helicopter to fly a group of snowboarders/skiers up a mountain and then depositing them at the top from which they descend. The mountains used by heli-operators are not usually within ski resort boundaries, so there is usually nobody else on the mountain aside from the heli-drop group. Therefore, the snowboarders/skiers will have all the untracked terrain to themselves, which normally means lots and lots of deep powder. As heli-snowboarders/skiers will be descending unmarked terrain, there is a reasonable level of danger from avalanches, crevasses, or unmarked cliffs. Therefore, heli-operations normally provide a local guide who knows the terrain well, and can lead the group down to the pick up point safely. One of the drawbacks of helicopters is that they are very vulnerable to bad weather, and it is quite common to hear of skiers and snowboarders waiting two weeks for a suitable window of good weather. This is generally because heli-ski operations fly to high, exposed terrain that is above the tree line. There are heli-ski operations located all over the world, from well known skiing nations like Switzerland and Canada, to much more remote and exotic locations, that don't even have ski resort infrastructure like Nepal and Kamchatka in Russia. Cat boarding or skiing is the practice of using a snow cat as a method of transport to reach untracked slopes in remote mountain areas that are outside of ski resorts. A snow cat is basically a large vehicle equipped with caterpillar tracks that can transport people up very steep snowy slopes. Sometimes referred to as the poor man's heli-skiing, cat-skiing is cheaper than its helicopter dependant cousin. Another advantage of cat-skiing/snowboarding over heli-skiing/snowboarding is that it is less vulnerable to bad weather conditions. This is due to the fact that cat-skiing operations tend to access terrain that is below the tree line, thus better protected from bad weather. Cat-skiing also tends to give you more runs for your money, but the runs are usually shorter than those accessed by helicopter. 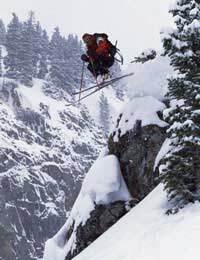 There are very few cat skiing operations in Europe, so the best place to find them is in North America, most notably in British Columbia Canada. Most heli-skiing/snowboarding and cat-skiing/snowboarding operations offer a range of different options to suit time and budget. These can vary considerably, from a few pounds for a single cat-boarding run, to several thousands of pounds for a mulit-day, multi-drop heli-snowboarding package. Both heli-skiing and cat-skiing are seen as the pinnacle of snow sports as they offer exclusive access to huge amounts of terrain, which means a small group of people get to ride lots of powder. Both heli-skiing and cat-skiing are rising in popularity, although some countries, for example France, have out lawed heli-drops.